if you listen, you can hear the first stirrings of winter loosening its grip. yes, the snow moon, that great white orb that cast its full light on the cold cruel landscape of last night, made it hard to see anything that was not white, or bluish white, a color even colder. but in fact, and despite the wind chill, this is the day when myth and legend begin their vernal whisperings. there’s the old folktale about the ground hog and his shadow. but that doesn’t much catch my fancy. what does catch it, locks it in its grip, is something i knew little about. until now. it is the jewish festival of tu b’shevat, the new year of the trees. it is, it seems, all about vernal whisperings, the first hint of promise that all this, the harsh and the cold and the barren, will soon melt away. as a woman married to a jew, as a woman who embraces spirit and rite and story and all things of the earth, this little holiday seems made for souls like me. i had had an inkling that the holiday i had a hard time pronouncing (tu-bish-vat, more or less) had something to do with trees or planting trees. in fact, it is said that this is the day when God decides how bountiful the fruit of each tree will be in the coming year. in israel, this is when the almond tree awakes from its winter sleep, erupting in clouds of tissue-white flowers, the first blossom of spring. in ancient times, tu b’shevat marked the day of tithing. it clanged the final bell on the fiscal year. all fruits borne before this day, belonged to the harvest of the last year, and must be divided accordingly, a portion to the poor, a portion to the temple in jerusalem. all of that was lovely enough. but then i heard something about a special seder of seven fruits. and that’s when i knew i needed to dig a little deeper. that’s when i discovered the thinking of the 16th-century jewish mystics. known as the kabbalists, these deeply spiritual thinkers believed that we elevate ourselves by the eating of certain fruits on tu b’shevat. if done with holy intention, they taught, sparks of light hidden in the fruit could be broken open from their shells, freed to float up to heaven, to the great divine, completing the circle of the renewal of life. they go on, these marvelous mystics. they talk not about seven fruits, but ten. they break them into categories corresponding to four levels of creation. there are the fruits that need no protection, and can be wholly eaten; grapes and figs, among them. there are fruits that require protection but only at the heart; olives, dates and persimmons would be among these. then there are the fruits that need full protection, the pomegranate and avocado, both of which hide inside a leathery shell. the fourth realm, purely spiritual, by definition has no fruits: it’s just pure spirit. reciting blessings–there is a particular line from the torah for each fruit or nut, believe it or not–helps to release the holy spark of life flow trapped within them, the kabbalists believed. ah, but the act of chewing, they tell us, kicks it all into some sort of spiritual overdrive. get this: chewing is more powerful than reciting blessings, they believed, because humans have 32 teeth, and that is the precise number of times the word “elohim,” or God, appears in the story of creation. goodness. it is morsels like that that make it so delicious to dig deep into something of which you once knew so little, but deep in your soul feel so drawn to. it’s the marvelous adventure, open to all of us, of cracking deep into the book of religions other than the one we knew first. it’s the weaving and steeping, the absorbing and unfolding, that i swear enriches the broth. but back to the fruits, and the part that i think is the absolute swooningest. along with the fruits of the seder, the kabbalists said there must be four glasses of wine at the meal. you begin, they taught, with a white wine. each glass after that adds more and more red wine, so that each glass deepens in color. the first glass represents the cold whiteness of winter, the next, the pale buds of spring, onto the deep rose of the height of summer, and finally the crimson of the autumn leaves before they fall from the trees. you needn’t be jewish to want to drop to your knees on that one, the breathtaking progression, the resonance of the fruit of the vine with the rhythms of earth, the unfolding. a whole sensory reminding that the changing of season is a blessing beyond blessing. and this is a day when we pause, when we listen, for the first stirrings of the deep underground. 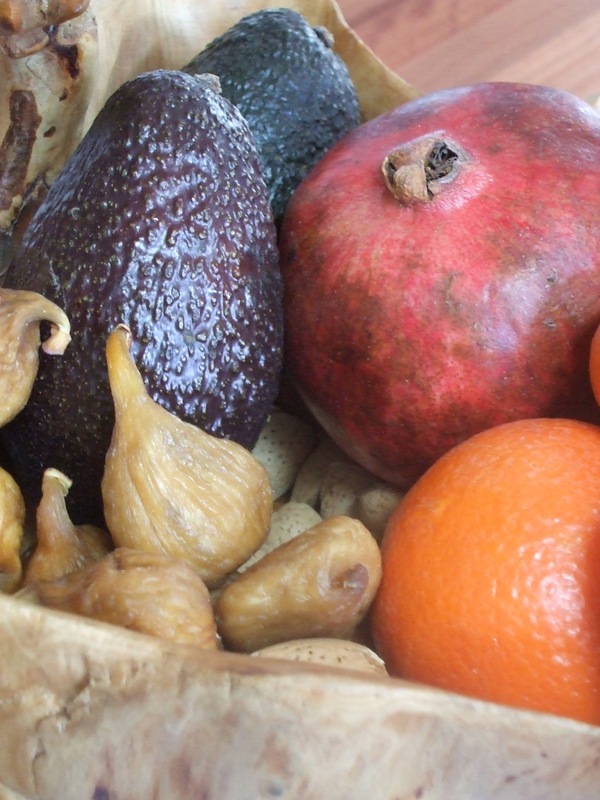 and so tonight, as i light the shabbat candles, usher in tu b’shevat, a sanctuary i never really knew until now, i will sit down to a feast of the earth’s promise, to fruits and nuts and wine. i will behold the shifting of the seasons, the absolute truth of the returning of life. yes, now winter is making itself abundantly present. but from the heart of the fruits, will break open great sparks of holiness, wafting toward heaven. from each sip of my ever-blushing wine, the taste of the turning of time. i will know as i eat and drink that beneath the cold hard snow, the fruits of spring are stirring. are whispering sacred incantations. vernal incantations. Rabbi Barbara,Given that I am a Jewish born, basically non-practising Jew, I am glad for my Catholic friends to teach me the beauty of Judaism. Seems like none of my Jewish friends know this, or perhaps I just never asked or listened. Thanks for the lesson. Shabbat Shalom. I’m also not Jewish, but love the idea of blessings bursting forth as we bite into a piece of fruit. The imagery is beautiful. We have no pomegranates today, but we do have a pineapple for our after school treat. My children might laugh (the older ones at least) but I will tell them this story and see if they can understand the idea of releasing life and blessing into the universe just through a piece of fruit.